I wrote this post in December and didn’t have my blog in place to post it. Now I have a place to share this with you. I’m currently on my way back from one of the best professional development opportunities I have participated in. The Women’s Leadership Institute is the result of a collaborative effort of 19 professional associations that support administrators in higher education. As a result, I just spent 4 days with 200 women from across the country who work in business affairs, libraries, student affairs, and academic affairs. Words cannot begin to explain the immeasurable boost of empowerment, personal development and challenge of thought that I have been given. So often we ask, what were your take aways? What are the top things you will carry with you as you go on about your work? – Personal Development. This conference was unique in the sense that it provided professional content knowledge and personal development. So often we attend conferences that are focused on sharing content knowledge and best practices; all while running from session to session and attempting to learn as much as possible. It is truly a rare occasion that we participate in a professional development opportunity that affords us the space to develop our personal leadership skills needed to implement our best ideas and practices. This rare opportunity is what was offered through the Institute. – Competition vs. Consultation– I’ve been to conferences and institutes with other women and often find myself in an environment that feels wrought with competition. Each person is trying to expand their network in hopes that it will provide that next big step and outdoing the person sitting next to them. Not at this institute. I never felt as though I was in competition with the other women in attendance. Every woman was encouraging, engaging, sharing, and empowering. 200 women. It was such a wonderful space to explore my personal leadership beliefs and discuss freely. – SELF CARE– I can honestly say that after coming back from this institute, I have taken better care of myself. Balance. My goodness I was out of balance and carried so much stress with me every day. I share this with you because I had the power to change how I engaged with work and the million other items on my plate. I was feeling like my to do list had more control over my life than I did! We must take care of ourselves by being in tune with what we need to achieve balance as we define it. The work will always be there and I have found that the people around me know this to be true as well. I was the one putting so much pressure on myself to do more, make more. While it was rewarded, my professional balance this past month has been rewarded just the same. I have confidence that I am a good professional and the people I work with know I am- they would not have hired me if I wasn’t! I ensure that I am meeting their expectations and if I can do more within my balanced frame then that’s bonus. – Reach higher. Why not? I attended a session about the university presidency and women aspirations to the presidency. I spoke with institute faculty who asked, “why not aspire to the presidency?” Higher education is about to experience a major transition since 49% of sitting presidents are over the age of 60. Who will replace them? How can the presidency be reshaped to be inclusive of women’s leadership? Especially women of color and other identities. The time is coming and we have a grand opportunity to impact the future of higher education leadership. If you reach for the stars, at least you will land among the clouds. I also made some wonderful professional friends in the process. Thank you to the ladies on Twitter in the #sachat for being such amazing people. I include those that were present IRL and those that were following and commenting on Twitter. This online professional community has afforded me the opportunity to connect with folks I may have never known. It has been something that I have cherished this year and has enriched my professional development ten fold in the short time I have been online. Now, for the reason this post is called “SALT.” There was a fabulous restaurant on site at the Ritz-Carlton at Amelia Island called Salt. The name reflects the cuisine and it’s unique use of salt from around the world to create a dining experience that is like none other. At first, I have to admit I was curious. I mean, it’s just salt right? Um, no. It wasn’t just salt. It was salt mined from around the world- carrying different minerals and flavors. And each bite was unique and scrumptious by using a different salt. Then I had the privilege of getting a massage. In that time, they used a hymilian salt to exfoliate. There were also lamps made of that same salt that purified the air. How amazing there were so many uses for salt! On the way home I had a layover in Cinncinati where the snow had fallen and ice was an issue. What did they have strewn about the ground? You guessed it- salt. All these encounters with salt made me think. How fascinating is it that one item can have so much to offer. But it also represented the beauty of what I had experienced at the Women’s Leadership Institute. I met women who came from across the country and from various positions, each bringing their unique perspectives and skills to the table. The institute “table” was a place where 200 women came together and shared in a personal and professional development experience that was like none other. As women we have the ability to lead in a variety of ways that can impact the future of higher education. Our personal leadership abilities are like the salt mentioned above. What does your unique leadership style look like? How do you compliment and alter the environment to make it even better than it was before? How do you put your leadership to use? My colleagues and friends of the #sachat group on Twitter prompted me to think about the one word New Year resolution activity. I am fortunate to be surrounded by such amazing, thoughtful and reflective colleagues. You can read more about it here, but to summarize you choose one word that becomes your theme for resolutions for the year. Just on the heels of an empowering Women’s Leadership Institute in December and two and a half week trip to India where I was immersed in a culture full of spirit, I couldn’t think of another word that would carry me through 2011 towards personal development. I honestly admit that my “spirit” had been tarnished, buried, and bruised over the last several years by a combination of things that I won’t expound upon here. But the fact remains, that while in India I finally felt my spirit revive inside of me. The dust and rubble that covered it was cleared away. You know that burning in your chest when you know you are alive and you want to shout out from the rooftops, “I’m alive!”? (ok, maybe you don’t but just go with it!) In just a few short days, I have more energy (even despite jet lag), resiliency, and desire to do all that is on my never ending “to-do” list. I got it back- the fire from inside is lit again. How this one word will translate into specific resolutions and actions for my inner and outer work are clearly illuminated now. I need to find ways to nurture my spirit and keep it alive. If it is buried, tarnished and bruised then I am not my best self for those around me. Spirit is the place from where I draw my courage, passion and agency to impact the world. 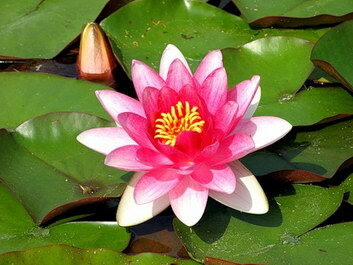 The Lotus flower is a common spiritual symbol in India and the unfolding petals suggest the expansion of the soul.